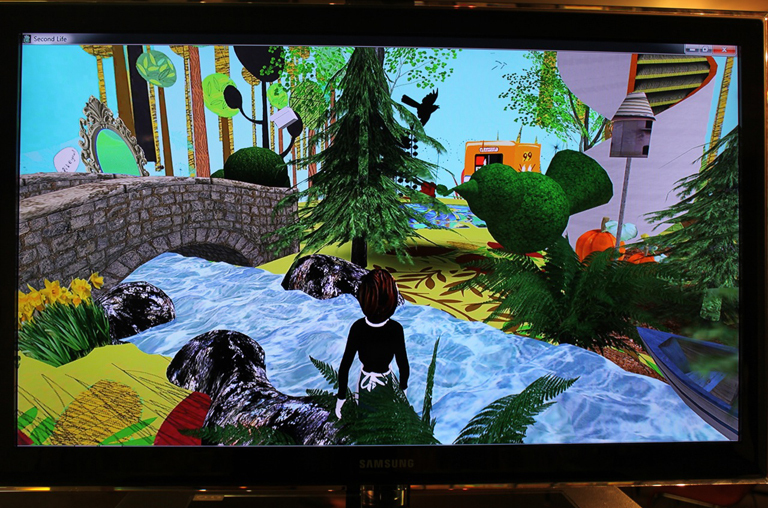 Confront your own avatar in Second Life as you explore the enchanted forest. This installation allows the Gallery visitor and their ‘second life’ virtual avatar to confront each other and coexist in the same enchanted forest environment in a live interactive public video installation. Simply stand in front of the video screen within the set and use the control keypad arrows to move you avatar around the scene. As you move around and explore this virtual forest scene you will discover that it is not only your Second Life avatar that exists in this space but through surprise encounters your virtual avatar will come face to face with its physical ‘first life’ counterpart. This project looks specifically at the concepts of presence and performance in SecondLife and first life and attempts to bridge these two spaces through mixed reality techniques and interfaces. The project further examines the notion of telepresence through the blurring between ‘online’ and ‘offline’ identities, and the signifiers and conditions that make us feel present in this world. This work questions how subjectivity is articulated in relation to embodiment and disembodiment. It explores the avatar in relation to its activating first life agent, focusing on the avatar's multiple identifications, such as gender roles, human/animal hybrids, and other archetypes, identifiable through visible codes and body forms in Second Life. The project aims to evaluate the diversity of personas and social life styles of the avatar. So as to explore this emerging relationship between the virtual and physical, Paul Sermon and Charlotte Gould have developed a number of interactive installations using “Second Life” that focus on the interaction and exchange between online and offline identities through social practices, such as performance, narrative, embodiment, activism, place and identity construction. Their collaborative experiments seek to question whether Second Life is a platform for potential social and cultural change - appropriated as a mirror image of first life. By consciously deciding to refer to this image that is mirrored as ‘first’ life rather than ‘real’ life, the authors' central question poses a paradox in Second Life when we consider Jacques Lacan’s proposition that the ‘self’ (or ego) is a formulation of our own body image reflected in the 'mirror stage’. However, there is no 'mirror stage' in Second Life, which would suggest that the computer screen itself is the very mirror we are looking for, one that allows the user to formulate her/his 'second self'.